Photosensitive epilepsy is going to be interesting with this! I was thinking the same, although the flicker is so rapid with this technology that it may be far less likely than say.. computer/TV displays or even normal LED lights to trigger it. Still I don’t know enough about the trigger point for an attack to make a judgement. Worth noting that CRT and LED/LCD refresh rates are perceived differently due to the technologies working in very different ways. A 60 refresh on CRT would give an ugly flicker in all content but 60Hz on an LCD is not something your eye will spot and is fairly normal (the backlight is key with LCD and that usually operates several times above 60Hz). fwiw I get sore eyes with prolonged use @ 60hz on LCD but not 72 so even if I can’t see the flicker as on crt I can feel the difference. Wasn’t this more about epilepsy? You’ll get sore eyes from using screens for all sorts of reasons. 2). The LCD backlight itself, more noticeable if it is an older Fluorescent light design. In both cases the screen itself does not flicker. LCD screens do NOT update like CRT screens did. In basic terms CRT screen drew lines rapidly, LCD tech turns pixels on, off, or dims/brightens them. Also most flat screens nowadays are LED lit and LEDs do not flicker unlike the older lighting from Fluorescent. Any perceived flicker from them and the LED light is normally down the the LEDs dimming or turning on and off completely to help produce more realistic black and white levels. Eye strain and Epilepsy with regards to modern screens today is more down to the light being emitted from them and motion of that light. Low refresh/frame rate in a screen and fast motion makes motion look stuttery. Prolonged viewing of it in some people actually makes them experience similar feelings to sea sickness and of course that can trigger Epilepsy also. 1. Resolution (higher is not always better for your eyes) lower resolution many make everything look bigger and blockier but if you are near sighted and sit close to a screen 24inches or smaller a lower resolution may actually be better for you. Near sighted-ness likes things bigger rather than smaller (4k resolution on a 22inch screen well thats some small icons and text which = eye strain for some). 2. Brightness and contrast… Turn brightness down, especially at night, all the way down as far as you can until white actually at first glance does not look like white anymore. On a decent modern (within the last 5 years) display you should not, if your monitors brightness setting is 1-100 ever need it above 30, not even if you are sitting right near a sunny window. At night you should be able to reduce that to around 20, possibly less. Do almost the same thing for contrast only kinda in reverse start at 100 and go as low as you can to retain black level. Number 2 is the most common issue wrong brightness normally makes your eyes feel dry, wrong contrast normally makes it feel like you have trouble focusing your eyes on something small or stuff at distance after using the monitor. The worst thing you can do with a computer screen is use one in a dim room, modern screens are much brighter than CRT tech was and unlike them which constatly updated by drawing lines LCD and LED screens do not so you are basically sitting in front of a GOOD AS always on bright light. If you go start at a light bulb only 3ft or so away for several hours thats going to F&^K up your eyes also, a modern screen is not that different. 2) if you use a screen which is in a room where the room light is normally lower than the screen light (especially a dark room) is buy a cheap bendy desk lamp and sit that by the side of the monitor pointing the light behind or upwards/away from the screen or better sit the lamp behind the monitor, your eyes will feel more relaxed as they are looking at a varying and gradual levels of light rather than just one searing your eyes like the sun. Thus reducing glare effect from the screen. If that does not help try different resolutions, but as far as flicker in an LCD i doubt that is the the main cause of your eye strain. PS… If you wear glasses do NOT bother being sold on the scam of lens which block blue light. Blue light is everywhere, its not just that damaging your eyes. Its the actual starring at a screen for hours, your eyes would become dry, sore, itchy etc if you stare at anything the same for hours. The amount of peoples eyes i see in a day that use computer screens and have helped their eyes just taking breaks, lowering screen brightness and adjusting room light is far greater than any witch craft magic lenses, new fangled screen tech and other lets sell you something, which wont solve anything fluff. Exactly what I was going to say. It might be secure through walls, but it could propagate for miles through windows. Mind you an attacker would need some quite large and specialised receivers to pull this off and that’s likely to be more obvious than somebody just sitting on a bench snooping the WiFi. Some ways around this would be to ensure that those outside cannot get an angle on the bulb(s), such as by changing the angle of blinds, using a polarised window filter or moving the lights themselves to angle differently so they can’t be locked from outside. How do devices communicate back to the hub in the other direction? This seems like niche technology, but kudos for the proponents. Being otherwise naive, this was a quick and helpful backgrounder – https://purelifi.com/technology/ . Diagram shows using PLC as the next hop (or PoE wiring to the socket). The latter being for new builds only. So this will mean our energy saving LED light bulbs will need to be on in daylight as well as when it is dark! Also interference is surely just as much a problem in a bright room during daytime? Infra-red has the advantage you can easily filter out visible light, but how does that work here with visible light from other sources and data to receive from LED bulbs using visible light? What about if you want to dim the lights to watch a streaming service but your streaming box or laptop is using LiFi? It seems infra-red is used to send data back up to the bulb, why not just use infra-red in both directions, which is capable of fast speeds as well? Seems like someone has a patent they are desperate to monetise, rather than this being anything practical or worthwhile. I doubt light is an issue here…plenty of tech ways to work out signal from noise…just as back in the day with modems. On their FAQ they do answer the question about using LiFi in daylight where they have stated they have tested it in 77,000 lux of sunlight, however a quick Google shows typical bright sunlight conditions are over a 100,000 lux, so make of that what you will. However indoors unless the device is sat in the sunshine on a windowsill it will hopefully be less than 77,000 lux. They don’t say if the data-rate suffers in bright conditions. You can dim the bulb down to around 10% to achieve an almost dark room, and for complete blackness they say other technology like infra-red could be used. Surely infra-red would be better to use for download and upload from the start…. but….. Doing a search for LiFi patents reveals there are many related to using visible light for data communication, hence using Infrared would be someone else’s patents and royalties paid elsewhere perhaps! You still need a special LED light, and that light needs to connect back to a network somehow, you need to override any switches to stop people just turning the lights off and breaking all communications! 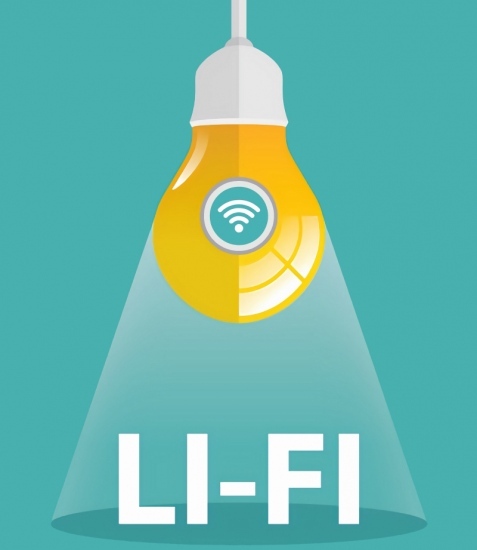 I fail to see any advantages over Wi-Fi, and given the improvements with new Wi-Fi Version 6, it just seems Li-Fi will be one of those things that will never take off because it doesn’t solve any problems. Congestion – pretty common in flats apartments. Not saying this is the solution but it might be. Been giving presentations at educational conferences (including the NSF HITEC Conference) for over a year about how “LiFi will Change Our Lives”. There has been a lot of great work being done in the Africa using LiFi.